Born on January 31, 1919, Jackie Roosevelt Robinson, (named in honor of President Theodore Roosevelt), excelled in nearly every sport he tried, including track, football, baseball, and basketball. In fact, he was the first athlete at UCLA to earn varsity letters in all 4 sports! 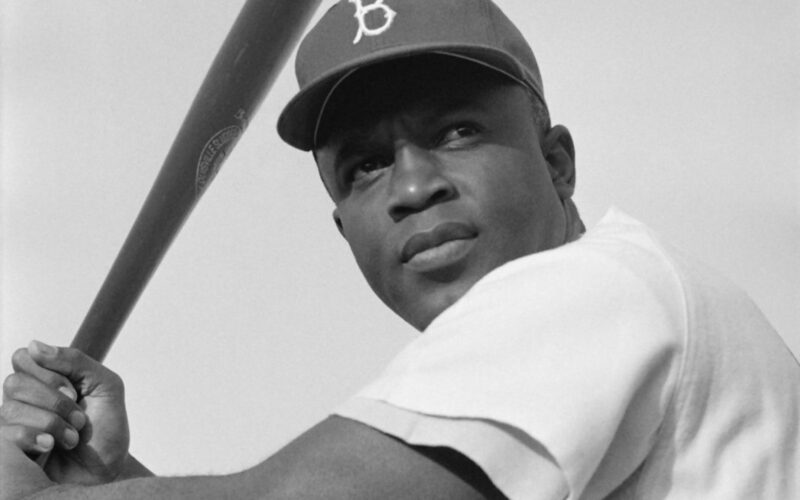 April 15, 1947 was the day in history when Jackie became the first African-American Major League baseball player. On that day, he suited up for the Brooklyn Dodgers, as the team went on to win the pennant, naming Jackie Rookie of the Year. Eventually the Dodgers went on to win the World Series in 1955 with Jackie at the forefront. Jackie Robinson was the ultimate example of sportsmanship, on and off the field. He played his best, encouraged his team members, and showed great respect to officials and coaches. Encourage kids to follow Jackie’s example by trying their best and showing good sportsmanship whether they win or lose. Even while facing strong adversity, Jackie pressed on. His perseverance was nothing short of amazing! From childhood on, Jackie pushed through personal barriers to achieve his goals. Talk about Jackie’s example to help your kids push through their own limitations. Let them know they can accomplish whatever they set their mind to if they only persevere! Throughout his entire life, Jackie fought for the equality of all people. He endured much opposition, but never let it stop him from making great strides in this country and the world. Teach kids to always treat others fairly. Talk about what it means to show respect and uphold equality on and off the field. While sports came easy for Jackie, it doesn’t mean he didn’t put in the hard work. Countless hours were spent training, preparing, and practicing what he loved most. He never settled for average, but pushed himself to go to the next level in everything he did. Encourage your kids to work hard in school, in sports, and in life. Teach them a strong work ethic by your own example. Never let them settle for less. Endurance is probably one of the most remembered things about Jackie Robinson. Few people have been able to continue through the fierce opposition he faced. Yet, he endured to the end and became a baseball legend. Talk to your kids about endurance and remind them that even when they fall, they can always get back up and try again! This centennial year, baseball fans around the world will celebrate Jackie Robinson with on-field tributes and events. Kids will also be included in the 100-year festivities. The Jackie Robinson Boys & Girls Club in Cairo, Georgia will honor the place of his birth, while the Atlanta Braves will host the annual youth baseball classic in his honor. To end this spectacular centennial year, the grand opening of the Jackie Robinson Museum in New York City will take place in December. Here are some fun ways you can celebrate Jackie Robinson in your family! Jackie made the No. 42 uniform famous and it was actually retired from the MBL in 1997. Get some fabric paint or markers and decorate No. 42 t-shirts. Be sure to wear them on April 15th! Grab some books at the library about Jackie Robinson’s life. Read them together as a family and talk about the ways in which he left a HUGE impact on our world. Rent or purchase the 2013 movie “42” and invite all of your friends! Make hotdogs and nachos and incorporate a fun baseball atmosphere. *For more information about Jackie Robinson celebrations in the U.S., check out JackieRobinson.org. Jackie Robinson may have retired from baseball in 1957, but his legacy lives on. He will long be remembered for his determination, perseverance, and tenacity. Not only did he pave the way for other African-Americans on the baseball field, he paved the way of equality for all people.